We get an assortment of newspapers delivered to our front veranda. Each morning at 5 am, I get semi-awakened by the thump of the thick roll of papers hitting our front door. I might be old (and old fashioned), but it gives me great pleasure to sit at my dining room table with a cup of coffee and methodically read a stack of newspapers. There is appeal to the tactile experiences of turning the pages, carefully scanning each page for headlines, and choosing an article to read. To me, the New York Times is the pinnacle of writing. Each week, I slowly consume each section of the Sunday Times, to prolong the whole pleasurable process over the maximum amount of time. 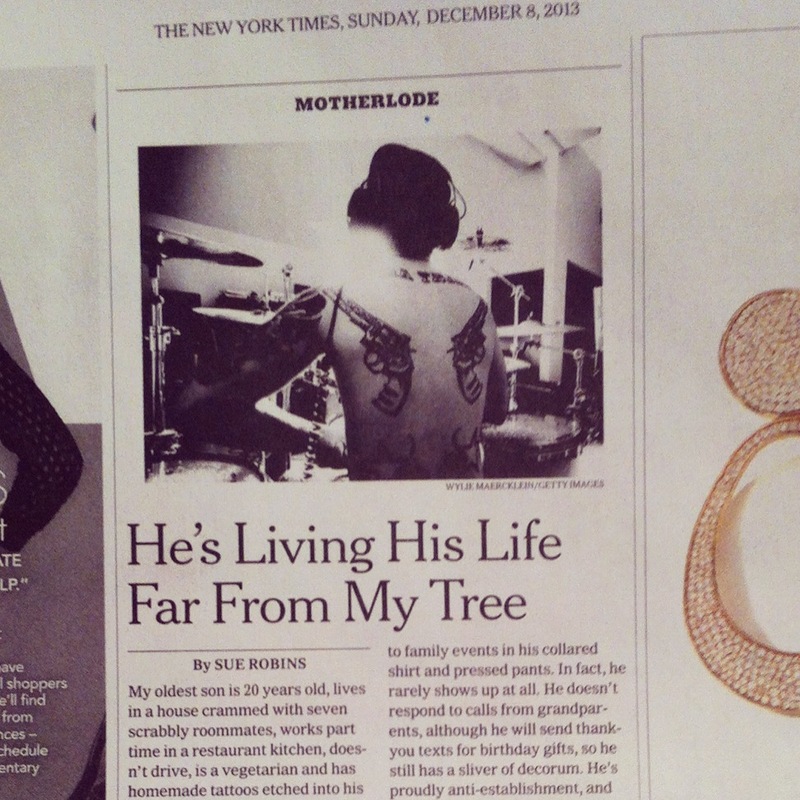 Last month, my essay Far from My Tree was published on the Motherlode blog on the New York Times website. Yesterday, I received an email from Natalie Serber, author of the book Shout Her Lovely Name, alerting me to the fact that the print edition of the Sunday Times picked up the essay that I wrote about my scrabbly, but beloved, musician son. And at 6:06 am this morning, when I collected the paper from my veranda, there it was. On page 18 of the Style section. Finding my name as a byline in the New York Times, Sunday edition? Well, that feels pretty great, folks. xo. A real accomplishment that almost none of us will ever achieve. Congratulations! 20 years of freelance and you are now a published New York Times writer!